I've always been interested in physics. It's the subject that tries to answer the ultimate question of how the universe, and everything in it, works at its most fundamental level. I took a few physics courses in college, but I started to shy away from the subject after taking modern physics and having it go way over my head. I had a hard time grasping the concepts at the time, but recently, like with mathematics, I've been thinking about getting back into studying it more. To kick off that activity, I started with two popular physics books that may be a little outdated, but should still have plenty of relevant, intriguing material on what has happened in the field post-Einstein. Both books are by prominent string theorists. The Elegant Universe was written in 1999 by Brian Greene, a professor of physics and mathematics at Columbia University. 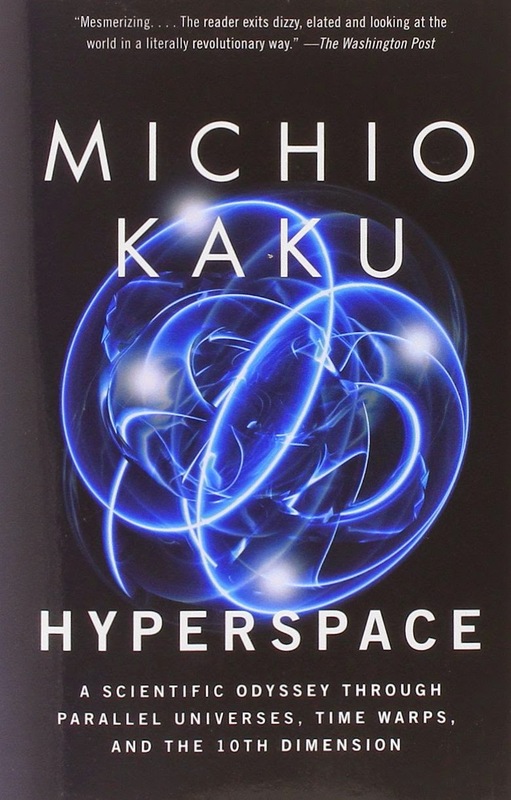 Hyperspace was written five years earlier in 1994 by Michio Kaku, a professor in theoretical physics at The City University of New York. From what I've read, there's a huge debate going on in theoretical physics right now about whether or not string theory is the future of how we will understand the universe, or if it's a dead end that will never produce meaningful predictions about how the universe works. I'm certainly not qualified to make any judgements about this debate, but I still believe that the investigations of string theory have merit because the exploration of ideas has value in and of itself. String theory has also made significant contributions to both mathematics and physics by developing new mathematical constructs and bringing various far-flung ideas between the two subjects together under one framework. That, however, is not the point of this book. The point is to give the reader a basic understanding of what string theory is about and how it affects our idea of how space-time works. Brian Greene is an excellent writer, and he does a great job of conveying his ideas in a way that non-theoretical physicists can understand. He starts out with a detailed description of Einstein's theories of Special and General Relativity and how they change our concept of the flow of time and the structure of space. Then he leaves the expanse of space to describe the main features of the very small particles of quantum mechanics. He wraps up this introductory material by explaining how these two sides of the universe—the very large and the very small—are incompatible when viewed within the confines of relativity and quantum mechanics. The two fields even come in direct conflict when trying to calculate what happens inside black holes or during the Big Bang. This conflict is what string theory attempts to resolve. The rest of the book describes what sting theory is, how it can combine relativity and quantum mechanics into one overarching Theory of Everything, and goes into a number of issues that the theory must address before it can be considered valid. Towards the end of the book, Greene gets caught up in generalities and doesn’t do as good of a job relating the physics he's describing to everyday reality. He talks about strings wrapping around curled up dimensions and branes covering tears in the fabric of space. It's very hard to visualize what he's talking about and what implications it has for the behavior of space-time, but maybe the vagueness betrays the fact that no one really understands what's going on here, yet. His other explanations are quite good, and reading the book generated tons of questions in my mind about how the concepts he was describing could be extended. For example, when he was describing how it's known that gravity travels at the speed of light, he goes through a thought experiment about what would happen to the planets if the sun suddenly exploded. The gist of the explanation is that the planets would not immediately leave their orbits because it would take time for the change in gravity to reach each planet. As I was reading, I wondered what would happen if instead of exploding, the sun disappeared entirely, just winking out of existence (never mind how that might physically happen). Would it still take time for the change in gravity to reach the planets? At first I struggled with this idea because it seemed to me that in the first case of the sun exploding, the change in gravity would move along with the remnants of the sun, so the fact that gravity would be limited to the speed of light wasn't surprising. The matter that was traveling outward from the blast would be limited by the speed of light, and the force of gravity would change based on what happened to the matter as it sped outward. What was surprising was that, according to Einstein, even if the sun just disappeared, the planets would still take time to notice the absence of the sun's gravity because the sun was warping the space around it and the planets were following the curve of space in their orbits. The speed at which space would flatten out in the absence of the sun would happen at the speed of light. Even after watching the video, it's still really hard to visualize what's going on, but every way of trying to imagine higher dimensions adds a bit more to our understanding. Understanding higher dimensions is a big part of string theory because in higher dimensions there is more room to unite all of the forces and fundamental particles into one theory. 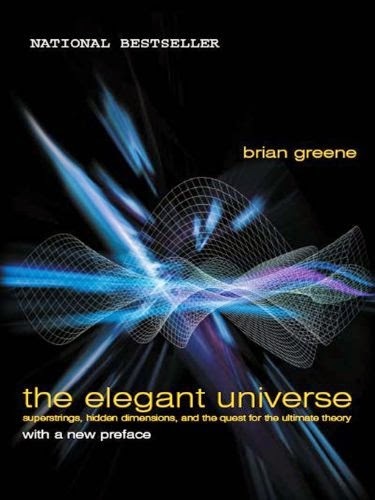 Greene does a great job describing the issues and implications with string theory, as well as much of the physics history that has led up to it. It was a great read that gave me a much better understanding of what string theory is all about, and I'm looking forward to reading more of his books. Hyperspace is another book about string theory, although the focus here is much more on higher dimensions than the details of vibrating strings and how they interact. Michio Kaku also spends a lot of time on the history of physics, and the older I get the more I appreciate the context that history provides. It will also be interesting to see how his ideas change in later books because of the impact of new technologies that have come into play since this book was written. He talks a fair amount about the possibility of the universe ending in the Big Crunch, but since the Hubble Telescope has been in service and our measurements of the cosmic microwave background (CMB) radiation have gotten better, we have pretty much ruled that out as a possibility. The LHC has also added many new discoveries to physics research and our understanding of quantum mechanics that would impact string theory as well. A Type I civilization is one that controls the energy resources of an entire planet. This civilization can control the weather, prevent earthquakes, mine deep in the earth’s crust, and harvest the oceans. This civilization has already completed the exploration of its solar system. A Type II civilization is one that controls the power of the sun itself. This does not mean passively harnessing solar energy; this civilization mines the sun. The energy needs of this civilization are so large that it directly consumes the power of the sun to drive its machines. This civilization will begin the colonization of local star systems. A Type III civilization is one that controls the power of an entire galaxy. For a power source, it harnesses the power of billions of star systems. It has probably mastered Einstein’s equations and can manipulate space-time at will. We are currently a Type 0 civilization, and when put in this context, it's pretty clear that the most important advances we can make right now are in energy production. Making progress in new computing devices, robotics, and transportation are still important, of course, but we're not going to get anywhere until we dramatically increase the amount of energy available to us. I also wonder if the process of advancement to a Type I civilization would go faster if more resources were allocated to it. We chronically underfund space exploration and basic research. However, Kaku makes an interesting argument that technological advancement should not outpace social development or else we'll be in critical danger of self-annihilation. We still need to figure out how to function productively as one world-wide civilization instead of a collection of nation-states in constant conflict. We will continue to be on the edge of destruction until we solve the political, social, and environmental problems that we're dealing with. Technology that's too advanced for our social structures will only make things worse. One consequence of this formulation is that a physical principle that unites many smaller physical theories must automatically unite many seemingly unrelated branches of mathematics. This is precisely what string theory accomplishes. In fact, of all physical theories, string theory unites by far the largest number of branches of mathematics into a single coherent picture. Perhaps one of the by-products of the physicists’ quest for unification will be the unification of mathematics as well. This seems like a pivotal accomplishment for our civilization, when and if it occurs. The book is packed with high-flying ideas like this that make you think and wonder about what is possible in our future. Kaku strikes a good balance between explaining the history of physics and its future potential. Like The Elegant Universe, I thoroughly enjoyed reading this book, and I look forward to more of Michio Kaku's books. If I had read books like these in college, I would have had a much better grasp of the general concepts of physics, and some of the things that flew over my head may have found a better place to stick instead. I'm sure I would have been much more motivated to understand the complex equations involved if I would have known that books like these existed (and read them). I'm definitely motivated now. Every aspiring physics major, and even hobbyists, should take a look at these books to see what wonders and paradoxes the universe holds. Ideas are a dime a dozen. On any given day I come up with multiple ideas for half a dozen different projects at home and at work. If I'm reading a good book, it will generate even more ideas, and I may want to remember or write about them at some later date. When you're thinking about hard problems, ideas just happen, and they can happen anywhere at anytime. Sometimes I feel overwhelmed with ideas, and I have to organize them. I've tried many different tools for managing these ideas, and they each have their pros and cons. I started out with a simple outlined list in Google Docs. I tried using mind maps. I even took a look at Basecamp. Finally, I settled on Trello, which seems to fit my preferred workflow pretty well. Here's a blow-by-blow of how I came to that conclusion and why Trello is working better for me than any other tools I've tried. The outline is the classic organizational tool. I learned in high school, as did many people, that when planning out a writing assignment, the outline is a great way to get your thoughts organized and to flesh them out. You can list your main points, sub-points for each main point, links to references, quotes, and detailed thoughts that you know you want to hit in your prose. You can go as deep as you need to go, and it's all laid out nicely on the page or screen so you can see your whole argument at once. If your outlines are on the computer, it's fairly easy to reorder ideas and modify them, allowing you to shape your argument as you see fit. There are software programs made specifically for outlining that make this even easier. I decided to go with Google Docs for my blog idea list because I already use it, it's a straightforward, low-tech solution, and it's available anywhere I have access to the internet. It's really important to be able to access these outlines almost anywhere, because that's where I get ideas—anywhere. I could carry a notebook for those times that I'm away from my main computer, but then I lose the flexibility of a digital document. Besides, Google Docs is so much more convenient. I can edit them anywhere and not worrying about keeping track of a physical object. It's very rare that I don't have access to Google, and in those situations where I don't, I can jot a note on a piece of paper, shove it in my pocket, and transfer it the next chance I get. I think I just talked myself out of ever buying a Moleskine. Google Docs isn't all good when it comes to keeping track of lots of blog ideas, though. Its main drawback is that it doesn't scale. If I want to keep all of the ideas in one document, and I'm expanding on a number of them while taking notes on a couple books that I'm reading at the same time, it gets unwieldy rather quickly. On top of that, once I'm done writing about a topic, I have to delete the notes for that topic or at least move them to another document so they don't clutter up my list of ideas with ones I've already written about. That's not efficient. Additionally, some of my notes for books will go on for multiple pages, which makes it difficult to get an overview of all of the topics I have to choose from when I want to pick one to write about. I could create a separate document for each topic, but then I lose the ability to organize the topics the way I want, and it becomes much more difficult to move ideas from one topic to another. In the end Google Docs was not working out so I went in search of alternatives. I was turned on to mind maps by Kathy Sierra, who passionately advocated for them on her blog. 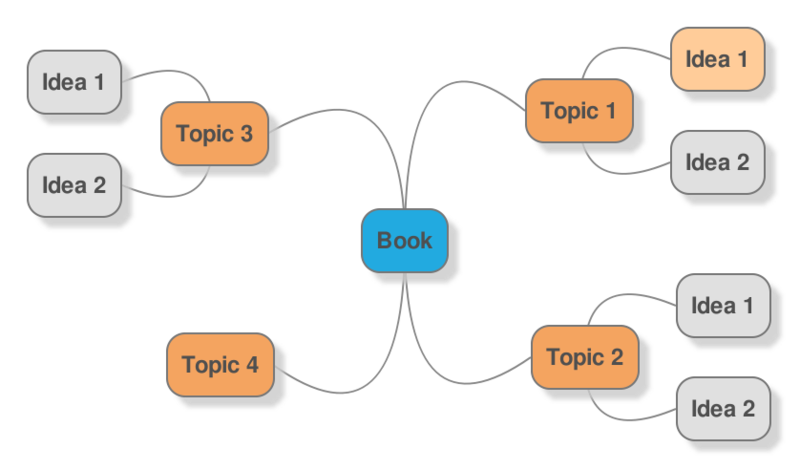 The idea is compelling, so I gave mind mapping a try by using them to take notes for half a dozen different books. What I found was that it didn't really fit in with my workflow, and it ended up being a lot more work than it was worth. For highly visual people, mind mapping may provide more benefit, but I guess I'm not one of those people. I didn't get much more insight into the books from looking at notes in mind map form than I do from looking at them in outline form. In the end outlines and mind maps are two equivalent ways to represent the same thing, but in different formats. For me, the mind map had a number of downsides in addition to those already plaguing outlines. First, the only decent software I could find at the time was desktop software, which severely limited my access to the maps. Today, I would probably use something like mindmup.com, which looks really slick. It saves maps to Google Drive, makes nice-looking maps like the one above, and it's free. Good cloud software eliminates the availability issue, but there are other issues. For instance, I read most of my books on a Kindle, and highlighting and taking notes is built into the Kindle software. I can do all of the note-taking I need without having to leave the book, everything is automatically copied up to Amazon's cloud, and then I can copy and paste my saved notes and quotes directly from Amazon's cloud to my blog. Building a mind map is a lot of extra work when the Kindle makes note taking so easy and seamless. That's not all. The biggest problem is that like outlines, mind maps don't scale well. It's hard to get a good overview of a ginormous mind map, and when all of my notes and quotes are added to a mind map, it gets pretty big. We're still only talking about a mind map for a single book, too. It doesn't even make sense to build a mind map with a book's worth of notes as one topic in a larger map of all of my blog ideas, so then I'm back to managing multiple maps for different things. Not ideal. Even a map of only my blog ideas doesn't work very well because they're all spread out on the map and scanning through them is not easy. Mind maps were not working out, so I moved on to another project organization tool. Basecamp.com aims to be a simple project management tool that allows you to collaborate with your team through discussions, to-do lists, and shared files and documents. It's a great tool for working on team projects, and I thought maybe it would also work well for managing blog ideas. The core useful feature in this case is the to-do list. As the only one working on the blog, I wouldn't have much use for the discussions, files, or documents. The to-do list can actually be a number of different to-do lists, each with their own title. This format essentially creates a two-level outline where the titles could be the different topics I want to write about, and the bullets would be the main points for each topic. Each bullet point can also have a comment thread attached to it, which could be used to expound on the corresponding points, if need be. You may have noticed that I'm talking about Basecamp as if I might use it, not that I did use it. That's true. I evaluated Basecamp and Trello together and decided to go with Trello, but Basecamp has a number of advantages over outlines and mind maps that make it a good option to consider, especially if you're working on a project with other people. First, as an online app, Basecamp is available everywhere. It also has smartphone and tablet versions for easy project management on those devices. Second, it looks like it should scale pretty well. The to-do lists are structured to keep things short and sweet with links to separate comment pages, so lists of dozens of blog ideas should be manageable. Finally, it's dead simple. There aren't many extra features, so there's basically no learning curve and working with it is very responsive and intuitive. If I wasn't using Trello, I'd probably be using Basecamp. Trello.com is a project management tool done in the spirit of agile software development. You can create a series of boards that correspond to projects, and on each board you can create cards that represent topics or tasks for that project. Each card can contain a description, colored labels, checklists, a due date, attachments, and comments. Cards are organized into columns with their own titles. This system is incredibly flexible, and it fits perfectly with what I want to do with my blog ideas. Having the cards organized into columns makes a board equivalent to a two-level outline in a very compact format that's easy to reorganize. I can make columns for different categories of topics that I want to talk about, and I have one column on the far left labeled "Up Next" to hold the next topic that I'm preparing to write on. Within the other columns I can sort the cards so the higher priority topics are at the top, and I can instantly see which categories have the most topics ripe for developing. Dragging the cards around to organize them is a snap. Looking at a board, I have a great overview of all of the ideas there, but I don't get overwhelmed with details. To drill down into one idea, I can click on that card to bring up all of the information on that idea, and I can review it, edit it, and add to it quickly and easily. I use the description to expand on the general idea in the title of the card. The checklists are handy for holding the main points I want to hit, and the comments work well for notes that don't fit well in the checklists. Links can be used anywhere, and they just work, making external references easily accessible. If I'm reading a physical book instead of a Kindle book, I'll even take all of my notes on one card. Even if it is a Kindle book, I'll put a few main points I want to address in a checklist and then link to the notes and highlights page for that book on my Amazon account. Once I'm done writing about a topic, I can archive the card so it's off the board but still available if I need it. Seamless, I tell you. Trello beautifully addresses my three main criteria for a great idea management tool. It's an online app with Android and iOS versions, so it's available everywhere. It's wonderfully scalable while staying compact—I could manage hundreds of ideas without getting overwhelmed. And it fits well with my organizational style, giving me a visual format that I can work with quickly and intuitively. Trello works so well for my blog ideas that I've been using it to keep track of my other work and personal projects as well. It works equally well for tracking project features, with features grouped by those you need to start, those you're currently working on, those you need to test, and those that you may or may not do in the far future. I'm not sure how Trello would work for collaborating with a team. It was definitely built for that purpose, but it may not scale too well that way. It probably depends on how well it's used by the whole team. For personal tracking, though, Trello is a big win for me. In summary, there are many ways to manage a big collection of ideas. The tools I covered here are by no means the only options, but they represent a good cross section of what's out there. Outlines are a basic tool that everyone should know about. They can be done in any text editor or word processor, and can represent a set of ideas in a straightforward, linear way. However, editing and organization can become a burden when the number of ideas gets too large, and it's difficult to maintain a history of completed ideas. Mind maps are equivalent to outlines, but are represented in a more visual format that works well for spacial learners. Maps can require more work to create and maintain than an outline, and compared to other tools, they get too big to manage rather quickly. Whereas outlines and mind maps are general tools with many different implementations—you can even use pen and paper to draw them out if need be—Basecamp and Trello are more specific tools built as dedicated applications. 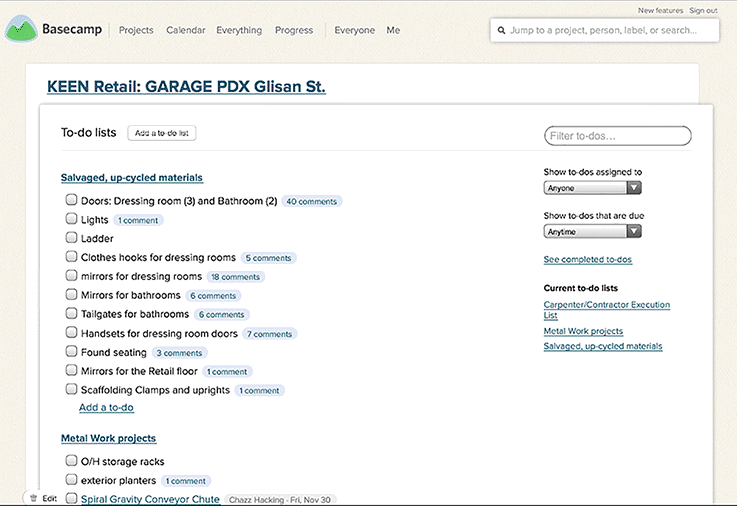 Basecamp is closer to an outline with its to-do lists, and it has additional features for collaboration. Trello is closer to a mind map, but is much more compact and easier to organize in comparison. Personally, I find Trello to be the easiest to use and the tool that best fits my style. It's been working great for me so far, and the more I use it, the better it gets. I wouldn't completely discount the other options, though. Each one might be the right choice in certain situations, and different solutions are going to work better for different people. The best thing to do is experiment and find out what works best for you.